A story of high hopes, human nature, and flawed green initiatives. ON A BRILLIANT DAY in June, I stood on a catwalk inside a dark, cavernous building, looking down at a mountain of garbage. Actually, it was recycling — newspapers, pickle jars, and, wait, was that a red plastic sled? A skid steer was shoveling crumbling chunks of the mountain onto a conveyor belt, which pulled the goods inside. If you live in or near Boston, there’s a fairly good chance your recycling comes here, to Casella in Charlestown. The biggest material recovery facility in the state, it sits just north of Bunker Hill Community College, hard against the Interstate 93 northbound lanes, and trucks drop about 750 tons of household- and business-generated recycling here every day. I’d driven by the place a hundred times on my way to the White Mountains and never noticed it. Standing on the catwalk, I felt oddly as if I were in the White Mountains. Or rather a weird, postmodern version of them. Twenty feet below, a river of cardboard flowed by on one conveyor belt. To my right, squashed milk jugs tumbled off another belt into a bin. On my left, a stream of yogurt containers and plastic salad trays bumped by. My ears filled with the whooshing roar of the place, which surprisingly didn’t smell like garbage. It was like a hyper-industrial hiking trail surrounded by babbling brooks of diaper boxes and beer cans. 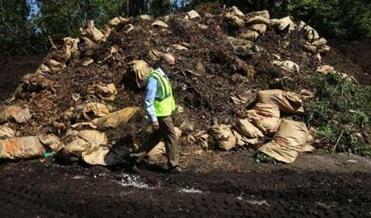 I had come to this mountain to solve a mystery: why Boston has such a dismal recycling record. The city’s “diversion rate,” industryspeak for the percentage of waste that is recycled or composted, is low, about 30 percent, compared with a national average of 34 percent. Comparably populated cities fare both better and worse: Baltimore is at 27 percent, Seattle, 55 percent. And among bigger cities, nobody comes close to San Francisco, at an impressive 80 percent. Cities calculate recycling rates in different ways, so, admittedly, these numbers are a bit squishy, but it’s clear that Boston is middling while San Francisco is shining. That city’s leaders are aiming to achieve “zero waste” by 2020, an idea more philosophical than practical, but still. At Casella, cardboard is compressed into bales; paper from single-stream initiatives is notoriously contaminated with trash and other recyclables. It’s not entirely fair to compare Boston and San Francisco. Both cities have challenging street plans and educated, densely packed populations. But Boston has a lower median household income ($49,000 to San Francisco’s $70,000), fewer people, and a narrower revenue base, relying heavily on property taxes. But budgets aside, many officials and activists in Boston see San Francisco as the gold standard. To be sure, Boston is getting greener. Bike lanes and Hubway docks are springing up like wildflowers, the city recently launched a sustainability initiative called Greenovate Boston, and Mayor Tom Menino has established efforts to reduce the city’s greenhouse gas emissions by 25 percent and plant 100,000 trees here by 2020. Boston now recycles waste in all its public schools and is putting recycling bins into public parks. The state, too, seems energized. In May, the Massachusetts Department of Environmental Protection released an ambitious 10-year Solid Waste Master Plan, which calls for raising the state’s diversion rate to 64 percent by 2020 and 90 percent by 2050. State legislators interested in keeping plastics out of rapidly filling landfills are discussing an expanded bottle bill and a ban on some bags. And in June 2014, the state’s commercial food-waste ban, the first in the country, will go into effect. Any facility generating more than a ton of food waste a week — universities, hospitals, hotels, some high schools — will have to compost it, rather than dump it as garbage. Change is afoot. But can Boston catch up with San Francisco or even Seattle? Maybe. To drive with DeRosa through the South End is to see the city through garbage-colored glasses. Instead of leafy parks and immaculate brownstones, you’re faced with a warren of apartment buildings and narrow alleys conspiring against proper waste collection. To increase recycling overall by easing the process for residents, Boston, San Francisco, and a growing number of communities nationwide have adopted what’s called single-stream recycling. 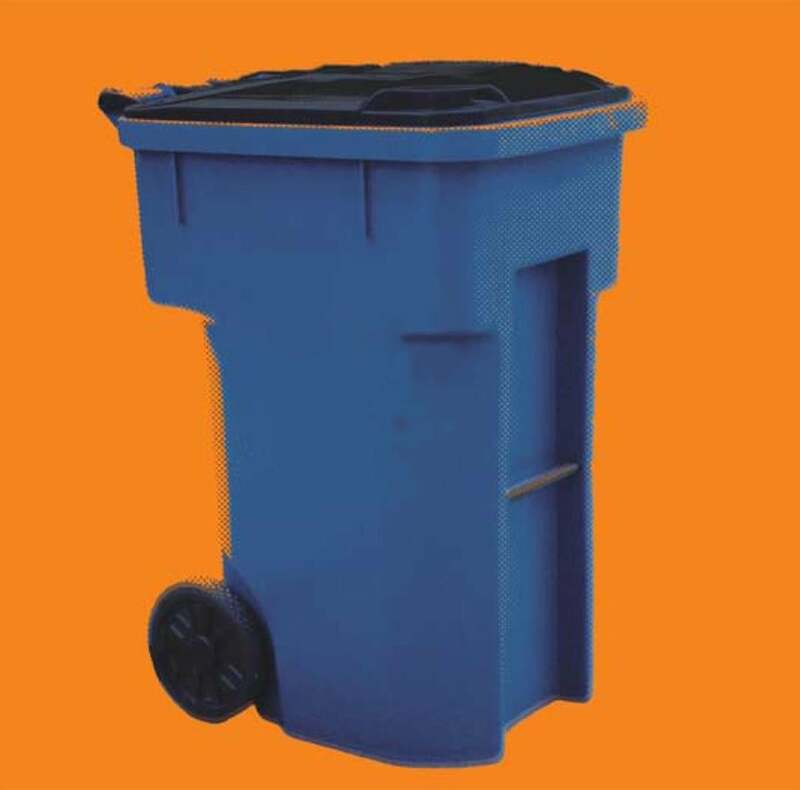 Instead of separating glass, plastics, paper, and cans, residents dump them together into one bin. Neal Klinman, a kindergarten teacher who lives in Brighton with his wife and three kids, loves it. Klinman was a diehard recycler anyway — he made his kids’ sandbox out of a discarded car-top cargo carrier — but says that single-stream has, well, streamlined the process. “It’s way easier,” he says. One evening after dinner, he lugs the recycling outside and tips it into a big blue cart on wheels with a satisfying crash. His 96-gallon “toter” is almost full. Then he holds up his trash for the week, which fits into two small Target bags. “That’s pretty cool, huh?” he says, smiling. Boston spent about $3 million to implement single-stream citywide in 2009, mostly on the cost of the rolling toters. Since then, the amount of recycling collected has shot up from 19,000 tons in fiscal 2008 to 32,000 tons in 2012. 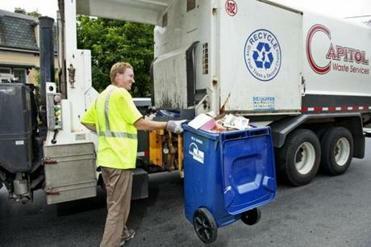 Over the same period, garbage collection dropped 11 percent, from 221,215 tons to 196,205. The introduction of single-stream has both decreased what we put in landfills and saved the city about $1.3 million each year. Boston currently pays $82 for every ton of garbage disposal, and in 2012 was paid an average of $1 for every ton of recycling. (The city has five contracts with collectors and brokers that use three facilities, depending on the district.) Recycling income or costs slide up or down each month depending on commodity prices — in the last few years, the city has either received or paid up to $40 per ton. But before we give ourselves a big green hug, it’s important to examine the other side of single-stream. This is where things get tricky, because increased collection of recyclables does not necessarily mean increased recycling. About 10 percent of what enters a US waste management facility from single-stream recycling winds up getting thrown away as trash. In Casella’s plant in Charlestown, the rate is better, but it’s still 8 percent. 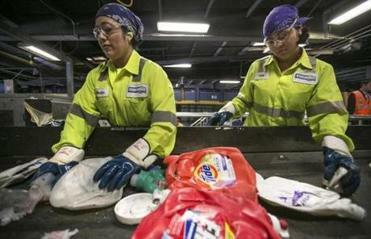 At the plant, six people using hands and hooks pull non-recyclables off the line before the machines take over. Broken umbrellas, Styrofoam containers, wire hangers, plastic bags: all trash. Workers also pull off some recyclables at this point. Rigid plastics — kiddie pools, that red sled I saw — go into one pit, and big pieces of metal — weight-lifting bars, cooking pots — into another. Screens filter out cardboard, magnets grab other metals, optical sorters separate different types of plastics — air jets shoot milk jugs onto one belt and colored plastic onto another. The results are huge bales of paper, aluminum, and plastic. (The most valuable? Aluminum, which sells for as much as $2,000 a ton. Newsprint sells for $200 a ton, tops.) Bob Cappadona, vice president of recycling for Casella, explains that the company audits bales to make sure the products are “clean” — that is, the paper bales contain paper, rather than metal or plastic. The company aims for a contamination rate of 1.5 percent or less. 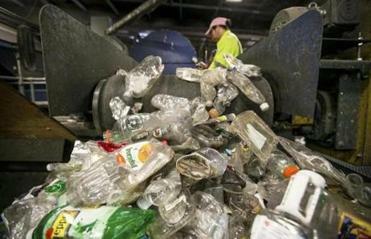 About a quarter of the single-stream recyclables collected is unusable and ends up in landfills or incinerators. IT SEEMS LOGICAL that if that crew of six working at the start of the line throws away 10 percent of what comes in, then the other 90 percent is recycled into new wine bottles, soda cans, and Frisbees. But that’s rarely the case. Usually, more material is lost after a waste management company sells the bales to a plastic, metal, paper, or glass recycler. And single-stream material is generally dirtier, with less usable content than the material that is separated by households and businesses before pickup. According to Susan Collins, president of a research group called the Container Recycling Institute, for every 100 tons of single-stream recyclables collected, only about 75 tons gets made into new products. The rest ends up in landfills or incinerators. “It’s a phenomenon we call ‘more junk in the bale,’ ” says Resa Dimino, director of public policy for the National Association for PET Container Resources, a trade association. PET plastic — polyethylene terephthalate, the stuff used for water bottles — makes up most of the plastic in the recycling stream, and it’s in high demand, says Dimino. Dimino offers some stark numbers. Since 2009, the portion of PET collected at the curb nationwide has inched up from 28 percent to just over 29 percent of what’s recycled. But the yield rate at the end of the process — how much of each bale can be made into plastic flake and then into new products — has dropped from 72 percent to 65 percent. “The reclaimers will recycle as much as possible,” says Dimino, though she’s not sure how much ends up in the trash. It’s the same basic problem with paper. National Fiber, a company in Belchertown that makes cellulose insulation from newsprint, phone books, and tax forms, won’t take single-stream material. Chris Hoch, the company’s owner, visited a recycling facility near Albany, New York, and was horrified. Along with paper in the bales, he saw the lids from tin cans and plastic bottle tops. Single stream’s biggest victim, though, is glass. During collection, much of the glass shatters into tiny pieces. (If it doesn’t break when you drop it in your giant bin, compacting garbage trucks finish the job.) Once in a recycling facility, glass shards are sorted by size and weight — basically falling through the cracks — and end up in a mountain of dirty confetti containing broken glass, bottle caps, and shreds of paper. It resembles actual glass as much as Velveeta resembles cheese. According to a study conducted by the nonprofit Container Recycling Institute and published in Resource Recycling magazine, which examined data from a dozen US glass processing facilities, only about 60 percent of single-stream glass can be turned into high-quality products like bottles or fiberglass. Another 19 percent is too small to be sorted — glass is separated by color for recycling — useful only for road base or landfill cover. The last 21 percent is trash. By contrast, about 98 percent of deposit glass can be recycled back into glass bottles. Better processing — like slowing down the sorting or separating glass from fiber at the plant — would result in more recycling, a win for the environment. But higher processing costs would be passed on to cities. Brian Swett, Boston’s chief of environment and energy, says he’s aware of the problem but doesn’t foresee it affecting the city. Swett says emerging technology, like better optical sorters and screens, will deliver a cleaner product. But if he’s wrong, Boston’s romance with single stream could come to an unhappy end. At Casella in Charlestown, the state’s biggest material recovery facility, workers pick out non-recyclables like Styrofoam from the mix. ANOTHER WAY CITIES increase recycling and decrease trash is to offer recycling for free but charge for the rest based on volume, a system known as pay-as-you-throw. “If I had to name two or three silver bullets in recycling,” says Collins of the Container Recycling Institute, “that’s one of them.” Hit people in the wallet, and they’ll think twice about throwing those tuna cans in the trash. In 2011, the city of Boston commissioned a study on pay-as-you-throw. The study, finished in 2012, found that pay-as-you-throw would give Boston a 20 to 30 percent reduction in waste and a 10 to 20 percent increase in recycling, with a huge cost savings. Despite these advantages, the city shelved the idea. Matt Mayrl, Boston’s chief of staff for public works, says the mayor was concerned about imposing new costs on families during tough economic times. Refuse collection in Boston has traditionally been a public service, paid for by property taxes. In San Francisco, citizens have paid for collection since 1932, so pay-as-you-throw saved a lot of people money. In Boston, people would suddenly have to pay for something that’s always been free — at least, it’s always seemed free. REMEMBER THAT GUY from the beginning of the story, Neal Klinman, kindergarten teacher, father of three? One reason his family tosses out only two small bags of garbage each week is their kitchen compost, collected in two huge Marshmallow Fluff tubs that Klinman brought home from school. Food scraps make up 20.6 percent of the waste stream in Massachusetts, according to the Department of Environmental Protection. Currently, the vast majority of those scraps either sit in a landfill with other garbage or wind up in one of the state’s seven waste-to-energy plants, where they are burned to generate electricity. Klinman’s wife, Deborah Bennett, is frustrated that Boston doesn’t offer curbside compost collection, like San Francisco and soon New York City. The problem here is that there’s nowhere to put it. One thing San Francisco has that we don’t: huge tracts of nearby accessible land, where giant piles of compost are hauled to decay. Boston currently sends yard waste and Christmas trees to a small composting site, and a few nearby farms take commercial food waste, but there isn’t enough local capacity to handle all the banana peels in the city. That is going to have to change, however, when the commercial food-waste ban goes into effect in summer 2014. One possible destination — for some of it, anyway — is the Deer Island Water Treatment Plant, near Logan Airport. Inside the facility’s 12 giant egg-shaped digesters, thickened sludge from sewers all over metro Boston ferments for 20 days at 95 degrees, constantly stirred by giant corkscrews. Bacteria gobble the sludge and produce methane, which is used to help power the facility. The plant pipes the treated water 9 miles offshore and sells the solid byproduct to be made into fertilizer. 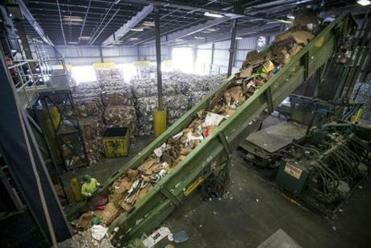 Food scraps ground up in household garbage disposers already end up at Deer Island, but the facility is not at capacity. Currently, the plant produces about 25 percent of its own power, but with 350 additional tons of food scraps mixed into the sludge every day, and some additional upgrades, it could generate about 50 percent. City and state officials expect that the food-waste ban will spur the growth of a composting infrastructure, which will facilitate curbside composting. The city of Cambridge, which already collects compost at more than half of its public schools, one senior center, and three drop-off locations, will begin a curbside pilot program in April 2014, and Boston is watching closely. Cambridge will give 800 households along one collection route a year’s supply of biodegradable bags, a kitchen scrap bucket, a curbside bin with a locking lid, and weekly pickup. If citizens play ball and Cambridge can reliably and cost-effectively gather 2 tons of compostable food scraps a week, the program could spread citywide, and also be a model for Boston. At Deer Island, I rode a gleaming silver elevator to an enclosed catwalk and stood on top of one of those giant eggs. The egg was singing — an otherworldly high-pitched note generated by the whirling corkscrew inside. I climbed a small step and looked out the window, across the blue harbor to the shimmering Boston skyline. I imagined barges of food scraps lumbering across the water and microbes in the eggs converting coffee grounds into energy. I imagined Boston as a sustainable city, where the recycling rate is a badge of civic pride, where it’s safer to ride a bicycle, and where it’s cool to wrap presents in used paper. “Change is possible,” says Kent Portney, a professor in the department of political science at Tufts University who studies sustainability in cities, “but in Boston it takes a lot more effort to push things over the hump.” Luckily, Bostonians like a challenge. Otherwise, why would we embrace a city with such crummy weather and impossible parking? Changing culture is slow and difficult, but it’s the only path to zero waste. San Francisco, here we come.